Last Minute Deal! 10% DISCOUNT ON HIGH SEASON WEEKS! Lavish design villa (133kvm) with sleek and stylish décor. Carefully selected materials of the highest quality. 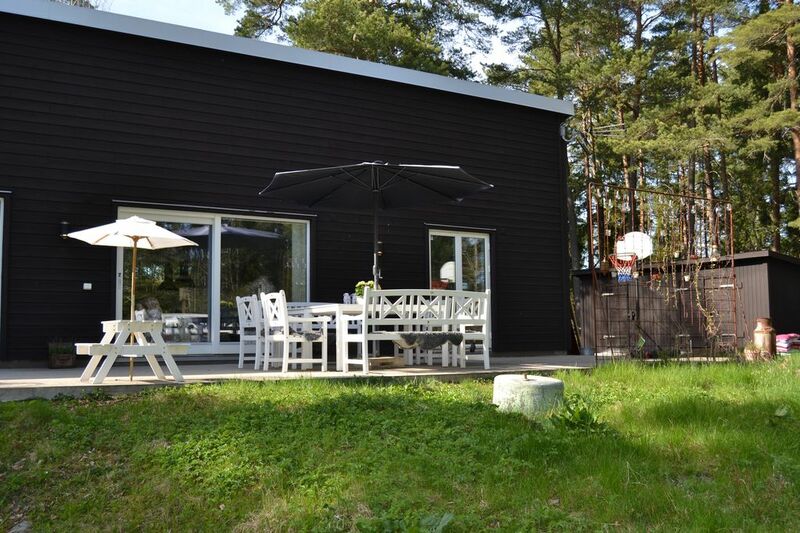 A unique house with amazing secluded in quiet area near Stockholm, bathing lake (400m) and the sea. Family friendly. The house is light and airy floor plan with large societies surfaces and wonderful atmosphere. Large modern kitchen with all its features. Open plan to the dining area dining table for 8 people. Seating area with two lovely sofas overlooking the patio, fully glazed window wall that can be opened up. Master Bedroom with double bed (180x200cm) and a bathroom with toilet, shower and bathtub. Exit to the patio. A children's bedroom with a single bed 120x200cm. TV. A guest room with single bed (140x200cm). Bathroom with toilet and shower. TV. Laundry room with washer / dryer. The garden, 1900 sqm, which is partly wooded site, the lawns of the front of the house, barbecue (charcoal) under roof with dining area, 100 sqm sunny patio with outdoor furniture (10 pers.) And seating areas. Basketball hoop and outdoor play equipment available to borrow. Location is wonderful with beautiful surroundings. Close to the lake with a sandy beach, jetty and diving tower. Havsbadshotell, soccer field, playground and restaurant within short walking distance. About 1 km to the supermarket. Mandatory departure cleaning 1 000 SEK. Pets not allowed. Wireless internet (fiber). On request; bed linen / towels 140kr / p. p.'s bicycle with child seat 350kr / week. Children Bicycle 350kr / w.
The house can also be rented on request between December 2016 - Feb. 2017 Furnished. This is a good location with good access via public transport to the centre of Stockholm. However as a family of five we were very disappointed with the amount of storage space available. The owner had left their belongings in all available storage space, leaving us some mobile racks on which to hang our clothes. The kitchen cupboards and fridge were also full of all the owners'food , making it very difficult for us to store our self catering items. It felt more like a house swap than a holiday rental property. We explained the situation to the rental company as we have not experienced this in any of the other holiday properties we have stayed at (we have travelled extensively in Europe and stayed at many other home away rental properties with our family). Unfortunately the rental company were not able to resolve this during our stay.